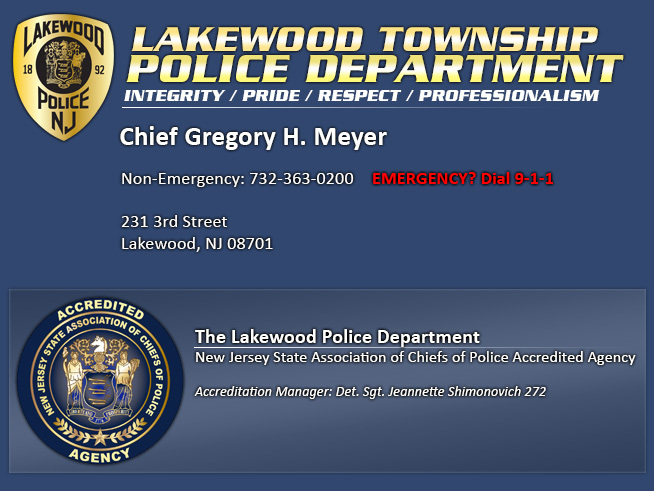 The Lakewood Police Department is pleased to announce we are hosting a monthly Child Passenger Safety Checkpoint. 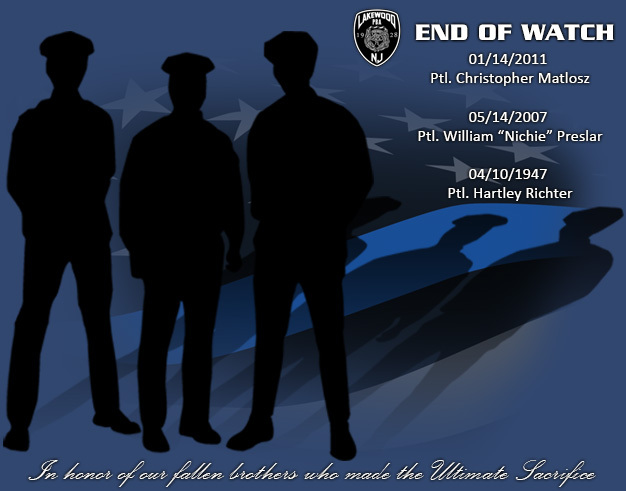 Starting Tuesday, February 5th 2019, from 5:00pm – 8:00pm located at 800 Monmouth Ave (Firehouse). The event will be held on the first Tuesday of every month. Each car seat will be properly checked and reinstalled which takes approximately 30 – 40 minutes. Certified Child Passenger Safety Technicians will inspect your car seat for expiration, recalls, improper installation, and proper use. If any issues are observed, the technician will address the problem(s) and educate the caregiver. The caregiver will be able to uninstall and reinstall the car seat in case they need to install the car seat in another vehicle. For more information, read our Frequently Asked Questions section below. 1. Are they giving away child car seats at the Safety Check? 2. Does the Car Seat Safety Check cost money? 3. What is the best car seat? 4. What is the best car seat to buy? 5. During cold weather, what is the best way to keep my child warm in their safety seat? 6. Which position in the vehicle is the safest for my child? 7. Why is facing rearward so important? 8. Why is riding rear-facing the safest? 9. My car was involved in a crash. The car seat looks fine; should I get a new child seat? 10. When do I move my baby into a forward-facing? 11. Is it safe for my rear-facing baby’s feet to touch the vehicle seatback? 12. I’ve seen products that say they can help make the seat belt fit better. Should we get one of these? 13. My 21lb, 9mo old daughter is rear-facing but her feet are touching the back of the vehicle seat. Should I turn her forward facing? 14. My sister-in-law told me that car seats expire. Is this true? 15. Why does a car seat expire? And how do I know if my car seat is expired? 16. How old does my child have to be to graduate out of his/her booster seat? 17. Should I fill out and send the registration card in to the manufacturer? 18. How can I find out if my child’s car seat is recalled? 19. What if my child’s feet are touching the vehicle seat when they are rear facing? 20. My baby weighs more than 22lbs, is not 1 years old yet, and out grew her infant seat. Can I turn her forward-facing? 21. My child is 7 years old and (55 lbs). Do I still have to use a booster seat? 22. I’m only going around the corner to the store; do I still need to put my child in his car seat for such a short trip? 23. When can my child ride in the front seat? 24. What if my car has air bags? 25. What about riding in taxi cabs, Ubers, friends’ cars or grandparents’ cars? 26. Is it safe for my child to wear a winter coat in her car seat? No. All caregivers need to have their own child car seat at the time of the check. No. The car seat safety check is a free service provided to everyone. We do not recommend any particular manufacturer or model. The “best” car seat is the seat that fits your child’s age and weight, fits well into your vehicle and can be used properly every trip. All seats on the retail market have had to pass the same Federal Motor Vehicle Safety Standards. For this reason, do not let a high price mislead you to think that the seat is safer than its lower priced neighbor on the shelf. Purchase one that: 1.) Fits your child 2.) Fits your vehicle 3.) Fits your budget. Our professional technicians can help you. Clothing worn by children can present compression and harness routing problems. Bulky jackets and snowsuits can compress in a crash and leave the harness slack on a child, allowing excessive movement or even ejection. It is best to have children travel without coats, or to add a blanket over the child after the harness has been buckled. Jackets that are worn the regular way should be no heavier than lightweight fleece fabric or be unfastened to allow contact between the child and the harness or vehicle belt. An option for an infant in an infant seat is a shower cap-style seat cover. This style of cover fits over the top of the infant seat, has an elastic band around the edge, and has no fabric behind or under the child. The middle back seat in a vehicle. The safest zone is as far away as possible from the point of impact in a frontal collision. Unfortunately, in some vehicles, it is next to impossible to install the car seat in the middle. In this case, it is safer to install the car seat behind the front passenger seat. Babies have heavy heads and fragile necks. The neck bones are soft, and the ligaments are stretchy. If the baby is facing forward in a frontal crash (the most common and most severe type of crash), the body is held back by the straps, but the head is not. The head is thrust forward, stretching the neck. Older children and adults wearing safety belts may end up with temporary neck injuries. But a baby’s neck bones are soft and actually separate during a crash, and the spinal cord can tear. It’s like yanking an electrical plug out of a socket by the cord and breaking the wires. In contrast, when a baby rides facing rearward, the whole body–head, neck, and torso–is cradled by the back of the safety seat in a frontal crash. Facing rearward also protects the baby better in other types of crashes, particularly side impacts. Children placed in the rear-facing position are 5 times safer in the event of a frontal collision. Frontal collisions are the most common and pose the largest threat; rear-facing seats are designed to absorb the energy after the forces have been spread across the infant’s back, which is the strongest part of their body. Many newer seats have a higher weight and height limit for rear-facing capabilities. Yes, after a collision the car seat should be replaced whether it was occupied or not. It is impossible to determine if the seat has sustained any stress damage, it must be replaced. Most insurance companies will compensate you for replacing the car seat. 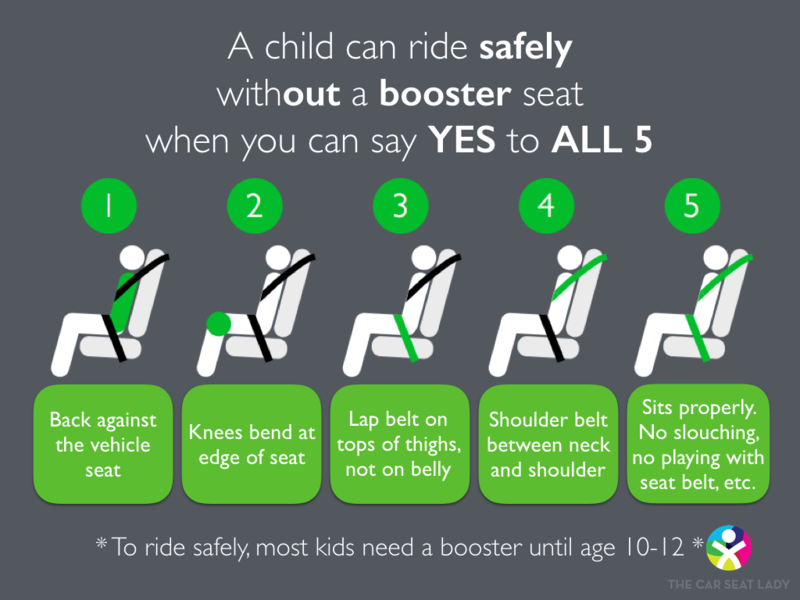 As per New Jersey Law states that your child needs to be from age 2 through age 4 and weighing up to 40 lbs., children must be secured in a seat with a 5 point harness, either rear-facing (up to height & weight limits of the particular seat), or forward-facing in the rear seat of the vehicle. There is no evidence that longer legs are at risk of injury in a crash; in fact, leg and foot injuries are more common in children facing the front of the car. Most children learn to fold up their legs for comfort when their feet touch the back of the vehicle seat. The only physical limit on rear-facing use is when the child’s head comes near the top of the safety seat. At this point, the child should be moved to a rear-facing convertible restraint. For taller rear-facing children, the concern is not potential leg injuries but possible head contact with the vehicle interior in a severe rear impact or during rebound from a severe frontal collision. No, these products should not be used. In fact, they may actually interfere with proper seat belt fit by causing the lap belt to ride too high on the stomach and making the shoulder belt too loose. They can even damage the seat belt. This rule applies to car seat seats too; do not use any extra products unless they came in the box with the seat. There are no federal safety standards for these products and until there are, they are not recommended. As long as children are riding in the correct restraint for their size and age, they should not need to use any additional devices. No. By law, she must remain rear-facing until she is at least 1 year of age AND at least 20 pounds – she must meet both criteria. It is also important to consider and compare potential injuries in a crash rear-facing versus forward-facing. A rear-facing child safety seat absorbs a majority of the crash forces and a child’s body (head and neck) is supported very well. In a forward-facing child safety seat, the child’s body (head and neck) must endure much more. Rear-facing with a child’s feet touching the back of the vehicle seat may result in an injury such as a broken leg(s), forward-facing a child too early may result in an injury such as a stretched spinal cord. Children should remain rear-facing until the maximum weight limit that their seat allows which can be 40-50 pounds. Yes. Car seat manufacturers are now stamping a date on the shell of their products stating to not use the seat after “x/x/xxxx” date. The expiration date may also be located on a white label that also contains your model number and date of manufacturer. Call your manufacturer for additional information. All car seats have an expiration date. Over time with exposure to sunlight and usage the plastic weakens and cannot provide its optimal performance. Most seats are good for 5-9 years, but you should always follow the manufacturer’s guidelines. 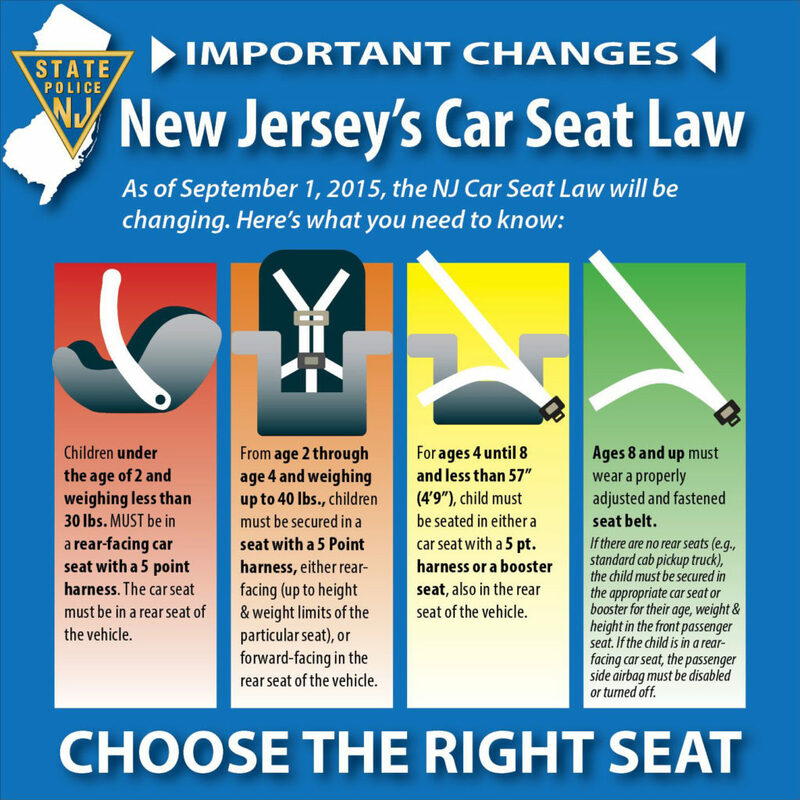 Per New Jersey law, a child must ride in a booster seat from age 4 until 8 years old. However, it is more about a child’s fit in the vehicle seat than it is age related. Your child should remain in a booster seat until they can sit all the way back in the vehicle seat, their knees bend over the edge of the seat and their feet touch the floor. When buckled up without a booster, the shoulder belt should cross the child’s hard collar bone (not the neck or face) and the lap belt should cross the child’s hard hip bones and upper thigh area (not the tummy). If these things are not met, the child is not yet big enough to ride without a booster seat. Yes, by sending in the registration card is how the manufacturer will notify you of any recalls. You can log on to their website. You will need to know the make and model of your car seat, the model number, and the date of manufacturer (this information can be found on the seat). It is perfectly normal for your child feet to touch the back of the vehicle seat, and this will happen with most children. Parents often mistaken the child’s feet touching as an indicator for turning the child forward facing, however if the child is still under the maximum weight, height allowed by their car seat for rear facing we encourage parents to keep them rear facing because it is 5 times safer then forward facing. No, your child should still be kept rear-facing because their bones have not yet developed enough to be facing forward yet. This is very common, you can search for a car seat that allows for a heavy weight such as a convertible seat or a different infant- only seat. A child under the age of 8, weighing 40 lbs or more but less than 80lbs and who stand less than 57 inches (4 feet-9 inches) tall needs to use a booster seat. A child cannot be expected to fit an adult seat belt system. For your child’s safety, keep him/her in a booster seat until they reach at least 8 years of age. Most definitely! Most car accidents occur at slower speeds in urban areas, and car cashes do happen very close to home. 5). Sits properly. No slouching, no playing with seat belt, etc. When used with seat belts, air bags are designed to protect adults. Children shouldn’t be leaning against a side air bag; if it inflates they are at risk of serious injury but children will not be at any added risk as long as they are in a correctly installed car seat that is placed in the allocated spot as instructed by the vehicle manufacturer. New Jersey’s law makes no exceptions for taxis, ride-sharing vehicles, limos or any other passenger vehicles that have seat belts. Children are still required to use the same type of car seats the law requires they use in their family’s car. This is a question that comes up every winter. The short answer is yes, it can be safe but only with the proper precautions. You see, wearing coats, heavy sweaters or fleeces, for that matter, can prevent a snug and very important fit of the harness, which has to be tight at the shoulders and hips every time. You might think your child is securely snug in the car seat when in fact the harness is not tight enough because there is so much air in the coat or clothing. Here’s a solution that could work. First, adjust the harness while your child’s coat is off. Unbuckle the harness, put the coat back on and then re-buckle. The harness may be tight, but it will fit properly. Of course, there may be different options depending on your specific situation or car seat, so check with your manufacturer if you have questions. And remember, the safest ride for a child is to use a car seat correctly, all year long!